On shared roundabouts cyclists and motorists share a single lane marked with a bicycle logo. A new roundabout design which includes large bicycle logos marked in the single lane of the roundabout is causing some confusing. The design — which is based on the National Cycle Manual — has been implemented by Dun Laoghaire-Rathdown County Council on the Sandyford Hall roundabout on the Kilgobbin Road in south Dublin. Herald.ie has a photograph of the roundabout, in an article covering the confusion. However, the article it self incorrectly and confusingly calls the main and only lane on the roundabout a “cycle lane” and “the lane marked for bicycles”. The roundabout is a single-lane roundabout, the centre overrun area is exclusively for large buses and trucks. Shared Roundabouts are characterised by a built central island clearly defined by a solid kerb, minimum 150mm high, and with a radius of 2.0m or larger. An overrun can be provided to facilitate larger vehicles if required. 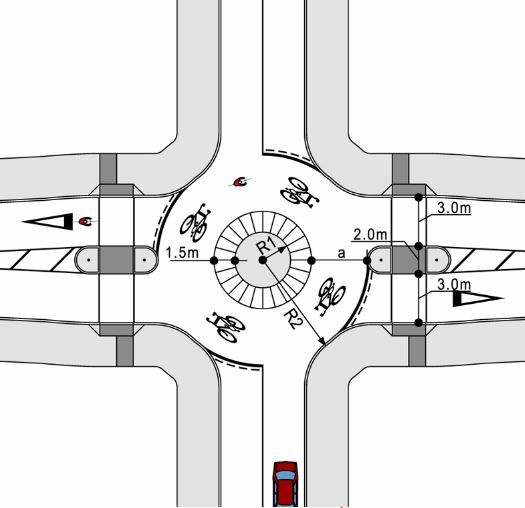 Shared roundabouts have single traffic lane approaches and a shared single circulating lane no wider than 4.0m. Shared roundabouts can be used in mixed street environments at junctions with design capacities of up to 6,000 vehicles per day, and where the vehicular speed on the approach roads is less than 50km/h. I have found most very large Roundabouts with large Volumes of Traffic never work well for Cyclists,they are just too dangerous. They were put in to facilitate motorists to speed trough without hindrance and do not suit Cyclists,you have to be very careful trying to avoid the traffic. All these large Roundabouts they have had to put Traffic lights on them eventually because of the dangers to cars not even speaking of Cyclists or pedestrians.It might be better to just turn it into a crossroads with Traffic light far safer. On the small little Roundabouts I do not have any problems with only very large ones. I think they should have a separated Cycle lane on this Roundabout ,it will be safer for everybody especially the Cyclists and pedestrians as it will force the traffic to slow down. ‘cycling-friendly roundabout’…sounds like a contradiction in terms. As an emigrant living in London, I’m very excited to hear about proposals for a Dutch-style roundabout on my current route (separate cycle lane around the roundabout! Cars must give way to bikes!). Any mumbling about this sort of thing back home?